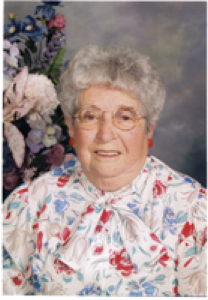 Ellen M. Uppenkamp, 96, Fair Haven Shelby County Home, 2901 Fair Rd., Sidney, Ohio died at the nursing home on Tuesday, February 28, 2006 at 6:15 PM. She was born May 17, 1909 in Covington, Ohio the daughter of James and Josephine (Cissner) Fletcher. She was married July 7, 1928 to Robert Uppenkamp and he died December 3, 1958. Surviving are three children, William Uppenkamp and wife Karen of Sidney, Ohio; Freda Wheeler of Sidney, Ohio; and Cheryl Umstead of Lafayette, Louisiana; seven grandchildren; ten great-grandchildren and ten great-great grandchildren; one sister, Bertha Cloyd of Greenville, Ohio. Three brothers and one sister are deceased. She was a member of Holy Angels Catholic Chruch where she was a member of the Altar Sodality. She was a homemaker. A Mass of Christian Burial will be held on Friday, March 3, 2006 at Holy Angels Catholic Church at 10:30 AM with Rev. Gerald Bensman. Friends may call at Salm-McGill and Tangeman Funeral Home on Thursday, March 2, 2006 from 6-8 PM. Memorial contributions may be made to Fair Haven Shelby County Home, 2901 Fair Rd., Sidney, Ohio 45365.